PLEASE USE THIS TOPIC FOR "HARDWARE" WISH-LIST SUGGESTIONS FOR FUTURE PA MODELS - NOT PA4X!!!! Thanks Paolo for getting back to our wish list. Thanks Pete to organize and separate the Hardware wish list from the OS wish list. GEM WK8 made in 1999.
in order any significant improvements to be feasible , since Pa4X hardware has been already pushed to it's limits ! - Real SATA port & USB 3 support (and not the current global USB 2) in order to save our valiable time when media rutines are executed. Both above are required in order real samples disk streaming to be applied plus the fact of expandable DDR Ram slots ! the best screen elevation system. Hardly a heavyweight now, any reduction in physical weight is always a bonus. Don't know if this can be done without sacrificing build quality, though. Hope so. This is my concept of a new arranger. I played pa80, pa2x, pa3x and now pa4x, and I was thinking a bit about what a modern arranger should be and how to deploy some functions as well as to add some new ones. Favorites are essential because we constantly have some sounds that we often use in the live gigs, and we constantly between them, so it is necessary that we have them easily accessible on the physical buttons. It also needs to be separated by a space between 8 and 9 for easy handling and orientate when we play live. A very important thing are the special buttons for the bank's int., user and direct for easy and quick access. The rubato style element is part of a style mostly without drum and rhythm, it's similar to backing sequence with bass and lower but different and more complex where some instruments play different phrases in different chords. Style select function: two style players where we can, while playing one style, prepare second style for next song with select button and set its tempo and element without affecting style that is already playing. When one style is about to end we have new one ready and easy accessible. Also, sometime two different styles with different tempo is needed for one song so this is most useful to easy switch between them. Songbook entry should set both style player settings. Every style should have 3 most common tempos default on tempo 1,2 and 3. It should be stored on style and songbook entry also. Half bar fill in is most useful in lot of situations and songs. Eight scenes for each style where we can store different volume, sounds effects ... for one style so it can sound differently on one click... if we need to add wah on guitar or similar things. Endless knobs with led indicators, also on sliders. 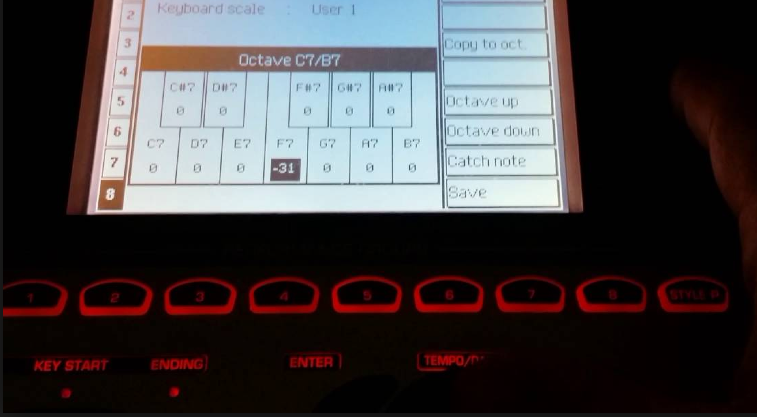 Favorite presets on ensemble and voice harmony, with easy accessible key buttons above. Live split mode is useful for musicians who need to play live with band and if they play bass with left hand or harmonies with string, piano, and various sounds. In live split mode, all sounds for left hand (lower) can be stored to style elements buttons, intros, variations... for easy access. Also it would be nice to have some analog sound engine like AL-1 if that is possible. That would be wooow to create some cool sounds. Also to add vector joystick with assignable functions. Adding the Quarter Tone mini-keyboard for the future replacement of Pa4X Oriental. It's already included in Pa600 Oriental and Pa700 Oriental versions, why not adding this feature to the future Pa5X Oriental or whatever the name will be for Oriental version. Screen shot of Korg Pa700 Oriental. 1- A 10" capacitive 4K touch display or at least FullHD (1920 x 1080) resolution. I can't believe that the current 7" on the Pa4X dose not even support the very old 720 HD resolution! Come on Korg, we are in 2018 and FullHD screens has been available in small smartphone's displays for ages now! 2- Dedicated hardware buttons for the oriental scale (Quarter Tone Scaling) with at least 3 memory buttons. Good example is the Yamaha PSR-A3000, and Ketron VEGA Oriental, not to forget the Korg's Pa600 and Pa700. On-screen oriental scale is never going to be as practical as a dedicated hardware buttons. 3- Adding multi-colored back-light to all hardware buttons with with back-light labels. Or at least single-color just like the old GEM WK8 or the new Yamaha Genos. The current small light indication on the buttons is not very helpful as it is still hard to see the labels and which button is which in dark environments! 5- HDMI output for FullHD monitors and TVs. 6- 2TB SSD for Storage (Upgradeable). 7- Much bigger RAM and ROM. 9- USB 3 and USB-C ports. 10- 256 voices of polyphony sounds like the new Yamaha Genos. 11- Support for WAV for playback and recording (Yamaha Genos). 12- Assignable knobs and faders with individual OLED parameter displays (Yamaha Genos). I've already added, the back light panel like GEM WK8, in hardware wish list. 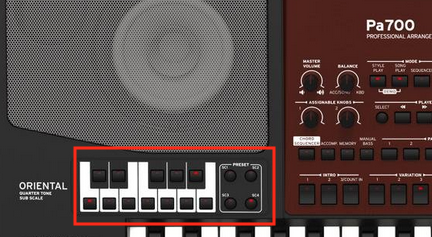 Hopefully we will see these features added in the future Korg Oriental version. Thanks BR, and hopefully we will see our request implemented in the next Pa5X Oriental ..